The world-famous Coca-Cola® contour bottle was created in 1915, the first dial telephone was introduced in the United States by AT&T in 1919, and Harley-Davidson® was the largest motorcycle manufacturer in the world by 1920. It's hard to believe that these American icons, 80+ years old, are still with us today. In 1901, Bill Peterson arrived from Denmark to start his new life as a blacksmith. Within twenty years he had built a successful business in DeWitt, Nebraska. Although good blacksmiths were still in demand in the early 1920s, the arrival of the automobile and gradual introduction of the farm tractor spelled the end. Long winters spent experimenting in his blacksmith shop with new tool designs took Petersen down a new road. By 1924 he had invented and patented the first VISE-GRIP locking pliers. It took four years. His early designs, conceived around 1920, were handmade by him and developed out of necessity because he needed an extra pair of hands around the shop to tackle jobs for which there was no tool. The photo, taken in 1924, shows a model featuring an adjustable jaw controlled by a screw in the end of the body. However, it lacked the famous locking mechanism, a feature added to the fourth prototype. Early sales were hampered by the stock market crash of 1929 and the harsh years of the Depression, but by 1934 a small family business had grown up in DeWitt—and Petersen Manufacturing Co. was here to stay. Bill continued his work on product refinement while two of his sons, Chris and Ralph, handled manufacturing. Another son, Richard, concentrated on developing a network of sales agents together with Harriet, Bill's daughter, who left teaching for full-time work in the family business. At that time the tool sold for $1.25; today it is priced at $12. By 1941 the DeWitt plant was operating at capacity to support the war effort. VISE-GRIP locking pliers became an integral part of wartime ship and aircraft construction. Consignments of tools were exported to England to help support the country's aircraft maintenance industry. Many American transport ships were constructed so quickly that many sailed with VISE-GRIP locking pliers welded into their hulls. The expiration of the original patent in 1941 encouraged the development of competition. Design innovation and line extensions helped the company continue its brand dominance. In 1948, two new ten-inch and two seven-inch models were launched with curved jaw configurations; and three years later, the first locking c-clamp, a derivation of the locking pliers design, was created. By 1957 the famous easy-release trigger was invented and added to all locking pliers. This design has become the classic VISE-GRIP locking pliers known around the world today. Petersen Manufacturing Company incorporated in the early 1950s and continued to grow throughout the 60s and 70s, paralleling America's post-war economic boom. Growing export sales underlined VISE-GRIP's dominance in the international locking tools market and major innovations built their worldwide reputation. The introduction of the 6LN® long-nose locking pliers in 1980 was a design milestone that paved the way for future line expansions and modifications, including the VISE-GRIP large-jaw locking pliers in 1994 and the introduction of the VISE-GRIP locking wrench in 1996. The 1980s also brought a new direction for Petersen Manufacturing Co., Inc. In 1985, Allen Petersen, CEO of Petersen Manufacturing Co. and grandson of Bill Petersen, purchased his family's interests in the company and at the same time established American Tool Companies, Inc., now IRWIN Industrial Tool Company, which owns Petersen Manufacturing Co., Inc.
Today VISE-GRIP locking tools are exported to over 120 countries around the world. Millions of tools are manufactured each year in the DeWitt, NE, plant—a few short blocks from the site of Bill Petersen's original blacksmith shop. I'll bet if you went door to door in your own neighborhood you would find a VISE-GRIP product in a kitchen drawer, toolbox, vehicle glove box, or fishing tackle box—or all four! It's one of those essential tools that has become an extension of our everyday needs. 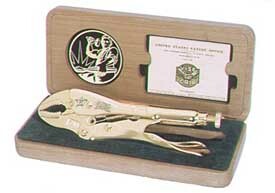 To celebrate the company's 75th anniversary, two commemorative VISE-GRIP sets were offered for sale: gold- and chrome-plated editions of today's model. A beautiful black walnut case displays the product. Hopefully you were one of the lucky ones able to get a set for your tool collection! in this article, in whole or in part, was supplied by American Tool Companies, Inc.